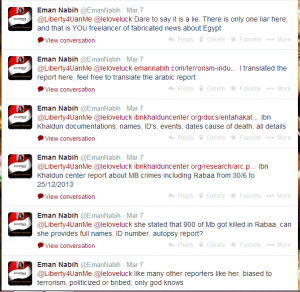 Testimony of victims of torture reveals the true nature of Muslim Brotherhood terrorist organization. 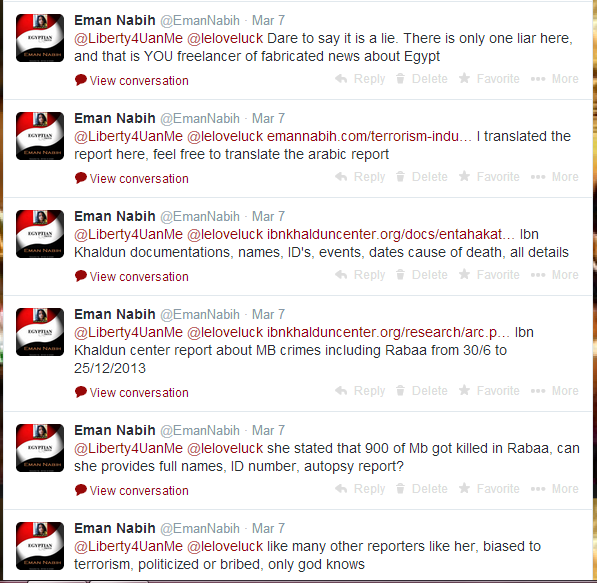 This testimony was not reported by any foreign reporters based in Egypt. Foreign news agencies reporters and journalists are deliberately publishing false news to convince the international public opinion that the Egyptian state is ruled by oppressors and violating human rights. I don’t need to provide any evidences to prove that foreign media especially in the US are biased to terrorism. Their fabricated news speak for itself. It is our duty as Egyptian citizens to publish what is really happening in Egypt, so our voice reaches the international public opinion. 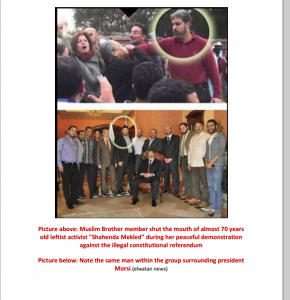 This article is about two massacres committed by Muslim Brotherhood against Egyptian citizens, and especially against Christians, which took place in MB headquarter in Mukatam area and Etihadeya presidential palace. The victims who survived the torture described what they lived and the horrible terrifying moments they eye-witnessed. It also contains evidence on the direct involvement of Mohamed Mursi with Muslim Brotherhood in killing and torturing protesters in front of Etihadeya palace, this evidence is presented by Mursi himself, thanks to his stupidity. This article is dedicated to the blatant liars foreign journalists and reporters based in Cairo who deliberately ignore that our voice reaches the international public opinion, and when we get the chance to correct their false news about Egypt, and no matter what we say or provide of evidences and documented reports, they claim that our sources whether local public or official are not reliable. They don’t even bother to interview the real victims. In addition, they describe trials and our judiciary authorities of corruption and framing charges against Muslim Brotherhood. Special dedication to Louisa Loveluck, British freelance journalist, based in Cairo writing for the Telegraph and Global Post, who told me that my sources are problematic when I corrected her on the fabricated stories she is publishing about forged figures and events of MB “victims”, as she described them. She said that there are errors in my bog, I don’t know what she meant by this. If there are grammatical or vocabulary errors, English is not my mother tongue language and I’m a blogger, not a journalist. 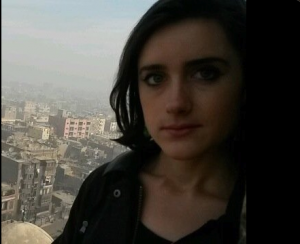 Perhaps the British Louisa doesn’t commit any grammatical errors in her articles, but she certainly commits deliberate lies, false and fabricated news through her perfect mother tongue language which only serves terrorism! I asked her to provide any evidence that can prove her claim, but of course she didn’t respond! 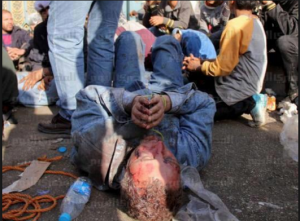 Victims of torture in front of El-Etehadeya presidential palace 4 December 2012, Muslim Brotherhood massacre against peaceful protesters and passers-by. 10 got killed and more than 800 got seriously injured. Court Case number 10790/2013. 4th of December 2012, the following videos showing Muslim Brotherhood militias and other Islamist Salafist and Gamma Islamiya group (Islamist group) attacking peaceful protesters and destroying their tents, attacking and beating women. 4/12/2012, source Alwatan Newspaper. The video says it all. Video of Mena Philipe’s testimony:” I was on my home when Muslim Brotherhood stopped me, checked my identity, found out that I’m Christian. They took off my clothes, dragged me, tortured me and I was brutally beaten. They told me that I’ll be slaughtered if I don’t confess that I got paid by the opposition parties to attack the presidential palace and protest against Musri and Brotherhood regime. There were many of them beating me. Then they delivered me to the police and the DA office, and many others were beaten like me, we were surprised that we were accused of criminal acts, while we were victims. The following video shows Egyptian citizens held inside the presidential palace, after they got arrested and tortured by Muslim Brotherhood who tried to force them to confess that they got paid to attack the presidential palace and protest against Musri and the Brotherhood. 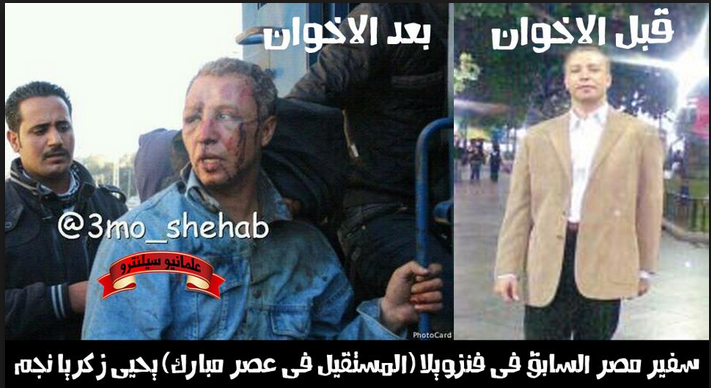 Former Ambassador of Egypt in Venezuela Yehia Zkaria Negm before and after he got tortured by Muslim Brotherhood in front of Etihadeya presidential palace 4 December 2012. The Former Ambassador’s testimony:” When I heard the news about Muslim Brotherhood attacks against peaceful protests in front of Etihadeya palace. I went to see what was happening and I eye-witnessed Muslim Brotherhood attacking women and beating protesters and destroying their tents. 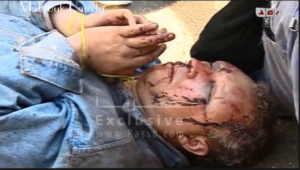 Muslim Brotherhood attacked us with weapons, white arms, firearms and tear Gas. Many of the Muslim Brotherhood kidnapped me and were beating me brutally in different parts of my body, the kind of beating that could have led to my death. They broke my ribs, my head was deeply injured. I was bleeding and they kept beating me. They were jumping on my chest with their shoes. They dragged me with others and held us in the presidential palace. After they tried to force us to confess that we were paid to protest against Mursi and to attack the palace, they delivered us to the police. Source CTV Egypt channel, another video showing Muslim Brotherhood members and leaders, torturing Egyptian citizens inside the mosque of Etihadeya presidential palace. They were telling them to confess that they got paid to attack the palace and protest against Mursi and Muslim Brotherhood regime, otherwise they will slaughter them. Mohamed Morsi official statement on 6/12/2012 on Etihadeya crimes exposed his lies and direct involvement in killing protesters, while the case was still under investigations by Mustafa Khater , the DA office counselor who handled the case. Mustafa Khater and Ibrahim Saleh, the counselors of the DA office who were investigating the case got threatened by Muslim Brotherhood and Mursi when they were in power to issue a decision of locking 143 persons that got arrested and interrogated by Muslim Brotherhood in front of Etihadeya palace, so the report of the DA office matches with Mursi’s statement. The next day of Mursi’s statement, Counselor Mustafa Khater issued a decision of releasing the 143 persons, because the investigations proved that they were victims of torture and arrested by Muslim Brotherhood members and leaders who held them, tortured them and forced them to confess of something they did not commit. In addition, the counselor decided to send the victims to forensic for injuries examination due to the brotherhood assault. 23 March 2013, 10 hours of torture inside Bilal mosque in Mokatam area, Cairo. Very close to the main headquarter of Muslim Brotherhood Organisation. Victims of torture told terrifying details about the Muslim Brothers torture practices against them, showed their injuries and torture marks on different parts of their bodies. Sherif Mostafa Mohamed testimony: I was walking in the street, all of a sudden some men attacked me and started to beat me with no reason, I was scared to death and I begged them to let me enter the mosque, I felt that I was going to die, I thought maybe they will show some mercy if I go inside the mosque, but I was wrong. 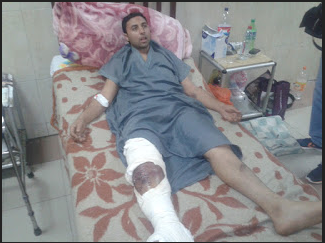 They started to beat me harder and told me to confess that I got paid to spy on Muslim Brotherhood. I saw others inside the mosque, some kids and young men. They slapped kids on their faces and broke their hands. There was a christian guy in horrible status, he looked like he was dying. They were forcing him to confess that he is a spy and they were beating him with a whip on his chest and back. Mostafa Mohamed, Sherif’s father: I called my son on his mobile, a guy answered and said your son is a spy and we are not going to leave him till he confesses. I went to the police and called human rights to save my son, finally I was able to reach my son, found him lying on the ground with others in front of the mosque in a terrible status. Waheed Mohamed and Saiid Fikry’s testimony: We were going to fill the motorcycle with Gas, we had to go to a specific Gas station in Mukatam area which is one street behind MB headquarter. Before reaching the Gas station, they blocked our way, pushed us down from the motorcycle and asked what were we doing there? We told them that we wanted to fill gas, they accused us of being spies. They took off our clothes, and dragged us to the MB headquarter. They stepped on our faces with their shoes and tortured us. 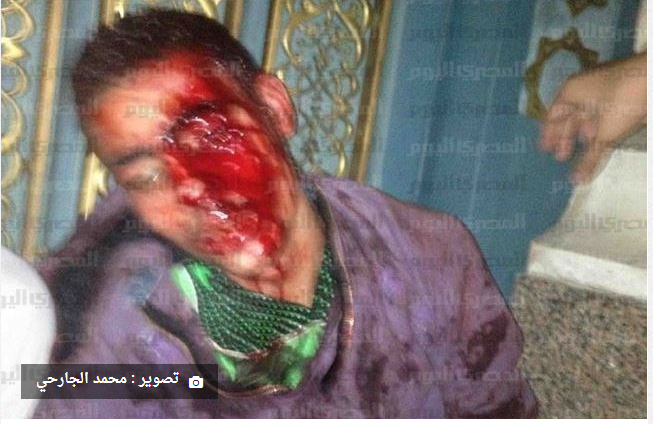 We saw about 15 to 20 young men were getting dragged and beaten inside the MB headquarter. They were telling us that this is what we deserve for saying NO to Mohamed Mursi and the Muslim Brotherhood regime. We saw a christian guy who was in a a very bad condition from torturing. They filmed us and said that we are armed criminals and came to their Headquarter to attack them. Ahmed Abd Elnaby’s testimony: I’m a carpenter, I work in Mukatam area. At 4:30 in the morning I was going home with a friend of mine who work with me. We were riding a motorcycle getting ready to go home when Muslim Brothers appeared in front of us, they took our identities and said that the ID’s show different addresses than Mukatam. They started beating us with steel pipes. They forced us to confess that we got hired and paid to attack their headquarter. They were beating my friend on his head several times, he looked like he was dying. He is in the hospital now in a critical condition. 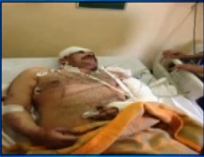 The victim’s father said that his family voted for Mohamed Mursi in the presidential elections, they thought that he was going to apply justice and develop the country, but now he realized that he voted for Mursi’s militias who tortured his son! Karim Hassan’s testimony: I was riding my motorcycle when 4 men blocked my way, they pushed me down and then others joined them. They started beating me and accused me of being atheist and the enemy of Islam. 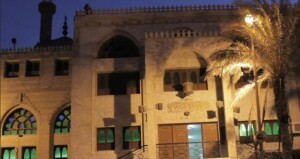 Mukatam Area, Bilal Mosque turned by Muslim Brotherhood to a slaughterhouse of torture. 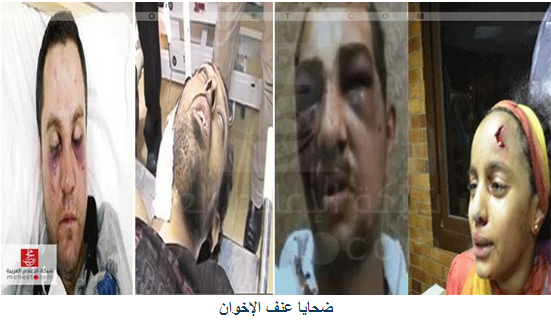 Amir Ayad, got brutally tortured by Muslim Brotherhood inside the mosque because he was Christian! Amir Ayad, Christian activist. He was protesting peacefully with others against MB practices in street 9, behind the Muslim Brothers headquarter in Mukatam area. 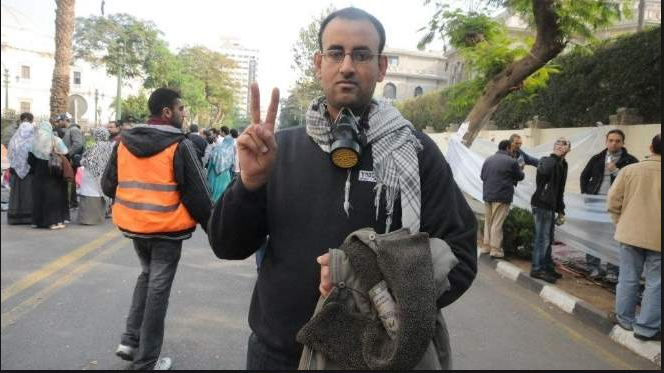 Journalist Nader shukry’s testimony: Amir Ayad had serious injuries from the torturing, resulted a surgery in his right shoulder due to double fracture, and a deep wound in his head ended with 36 stitches. He also had different bruises, torturing marks all over his body. He was treated in the Red Cross hospital. Amir got brutally beaten with sharp tools. I was with Nader and other protesters, and before we reached MB headquarter in Mukatam, we got attacked by Muslim Brothers ambushes, located in Mukatam mountain area. They used firearms, broken marbles, Molotov, stones and white arms against us. Due to the fierce attack, we had no choice but to dispersed in different streets in Mukatam. Muslim Brotherhood went chasing us and they were attacking home buildings in the area and passers-by searching for us. They also occupied the mosques located in the area and turn them to a slaughterhouse torture. 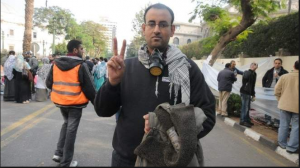 Bilal mosque was among other mosques which was used by MB in torturing protesters, including Amir Ayad. During the attack, Amir just disappeared and we failed in reaching his mobile. 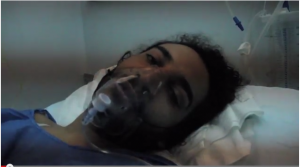 We finally found Amir in the hospital. We went to the hospital and interviewed Amir, who told us that he was trying to help other protests to escape from the Muslim Brothers attacks, when they kidnapped him and dragged him to Bilal mosque. 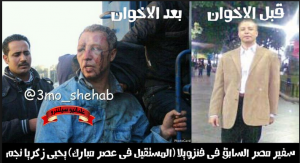 Muslim Brotherhood brutally tortured him more than others for being Christian and was accused of belonging to Christianity the enemy of Islam! If all the above are framed evidences, and all the charges against Muslim Brotherhood are fake, and all those victims of torture are liars and they are the ones who tortured themselves and the Muslim Brotherhood are victims and innocents as they are described by foreign media and the Obama’s administration, then we are the green men living on planet Mars and not in Egypt!